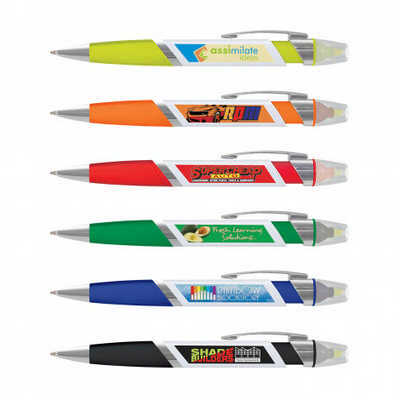 Retractable plastic and metal ball pen with a built in yellow highlighter. It has a frosted translucent soft touch grip, a clear highlighter cover and shiny chrome trim. Avenger can be branded in stunning full colour on both sides of the barrel. It has a black TRENDS refill with 600 metres of German manufactured DOKUMENTAL ink and a tungsten carbide ball for improved writing quality. Colours: Yellow, Orange, Red, Green, Blue, Purple, Black. Dimension: Dia 14mm x L 151mm x 19mm (includes clip). Print Description: Position D & E - 10mm x 35mm. Print Type: Pad Print. Packing: Loose packed or an optional presentation box or sleeve. Price includes : 1 Col 1 Pos Print. Setup is included.